How Consistent Are The Dog Food Product Details Online? We gathered some guides about how to read dog food labels, and came up with four common details all dog owners are told to look for. We then picked one type of dog food, four top pet supply retailers, and analyzed how thoroughly each company represented the product online. Surely, phrases like “weight maintenance” and “chicken and rice” on a bag of dog food give consumers a good idea of what they’re buying. But when it comes to identifying mysterious byproducts or decoding long, chemical-sounding names included on the label, there are many online guides to help consumers crack the fine print. We picked guides from three well-known organizations – WebMD, PetMD, and the FDA – and created a composite list of guidelines to direct our own research. The ingredients, recommended serving sizes, guaranteed analysis, and nutritional adequacy statement are commonly cited as important components on a label. We then identified four of the top pet supply retailers – Petco, PetSmart, 1-800-PetMeds and 1800PetSupplies.com – and picked a common dog food offered between them: Blue Buffalo’s Life Protection Formula Chicken and Brown Rice Recipe for Large Breed Adult Dogs. For each item on our list of guidelines, we compared how well each website conveyed the information for our selected dog food, both against one another and against the official Blue Buffalo product page. It wasn’t long before we noticed the inconsistency in product detail among these online retailers. From discrepancies in specific numbers to the omission of important info, there was not a single website without fault. Just like with the food we consume, ingredients on a dog food label are required to be listed by weight. If a dog has specific allergies, or an owner is concerned about specific preservatives, the ingredients list holds quick answers. Consumers can also get a better understanding of the proportions of particular ingredients or how a particular food is flavored, among other analyses. We quickly noticed that no two ingredients lists were the same either. Only 1-800-PetMeds was a perfect match to the official Blue Buffalo product page. Beyond the first two ingredients, the rest of the websites display the remaining ingredients in a variety of orders. 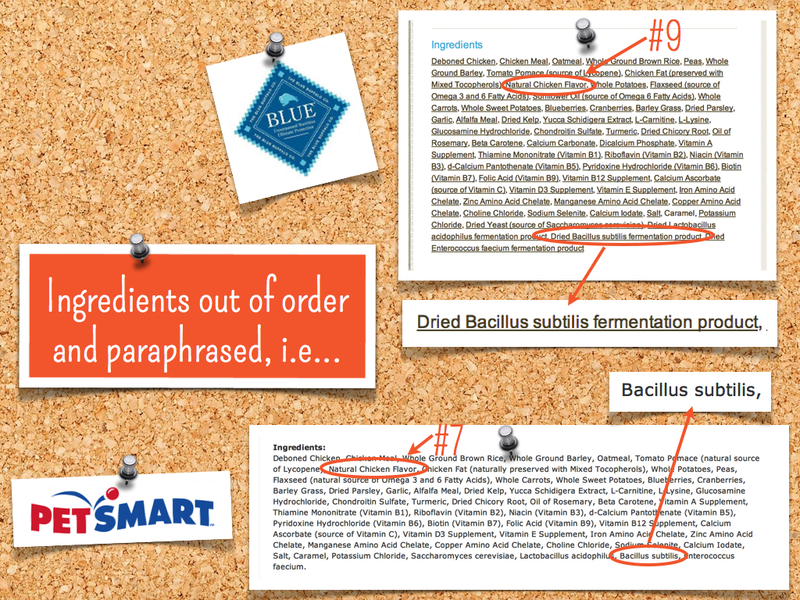 They also get sloppy heading into the preservatives at the bottom of the list, abbreviating names and omitting info. 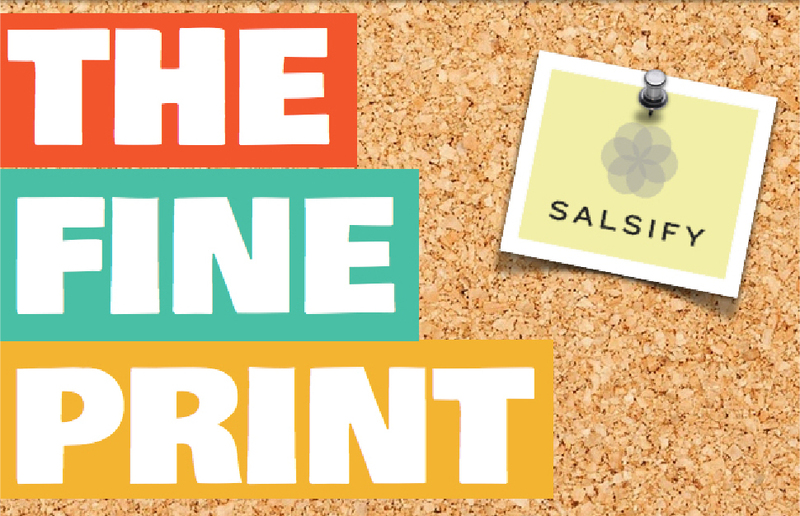 But because there are dozens of ingredients listed in tiny print, consumers would probably never be aware of these discrepancies – unless, that is, they conducted a comparison study similar to ours. Each guide encourages pet owners to ultimately consult their veterinarians about portions, but recommended serving sizes from the manufacturer are not without their merit. They can give consumers an idea of the calories per serving, as well as provide tips to transition dogs over to the new food. We found that companies are most likely to take wording from the manufacturer’s website when it comes to issues related to serving size, but also take the most liberty picking and choosing what information to include. Petco omits meal frequency. PetSmart neglects transitioning info and the veterinarian consultation disclaimer. 1800PetSupplies.com does away with serving sizes altogether. 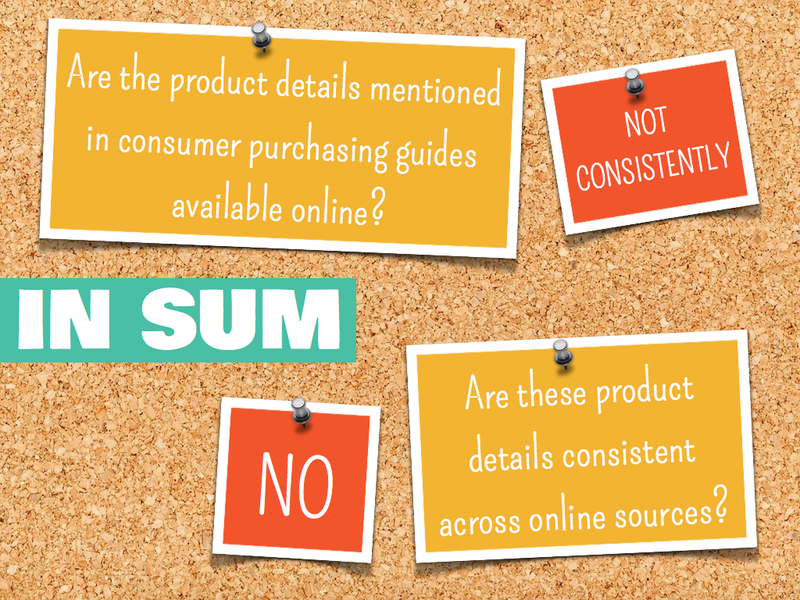 If consumers suspect they have to consult three or four websites to glean the entire picture about a single product, they’ll be less apt to go online at all. If websites are already taking the wording for these sections directly from the manufacturer’s site, they should also be willing to just include all the information. Most states require dog food manufacturers to include the minimum percentages of crude fiber and moisture, and maximum percentages of crude protein and fat somewhere on the label. Many companies go a step further and include percentages for numerous other nutrients as well. Dedicated pet owners can conduct a series of calculations with these numbers to get a better understanding of nutrient content in the food, and compare nutritional value between products. Only 1-800-PetMeds features an identical guaranteed analysis table to the one on the official Blue Buffalo website. The other companies contain a variety of different quantities and jumble the order of these nutrients. While the different numbers are still close enough in value to retain the relative proportions of each nutrients, the lack of standardization diminishes confidence in the accuracy of these details. On our dog food’s official product page, the AAFCO nutrition statement is clearly posted and explicitly labeled. Yet, out of our four online retailers, only 1-800-PetMeds includes this statement anywhere on its website. It’s a tiny detail, but there are big consequences for its omission: consumers are dissuaded from engaging in the product altogether if the detail is not included. The inconsistency of information found on these websites illustrate that there's plenty of room for improvement when it comes to transferring product content within the pet supply industry. Sure, if the order of a few ingredients gets switched around, or the feeding guidelines omit info about transitioning a dog to the new food, chances are most consumers won't notice. But the biggest potential ramification of displaying inconsistent data, and getting caught doing so, is a lack of trust amongst consumers. If no one's carefully double-checking the order of ingredients, who is to say a few aren't being left out entirely? Perhaps it doesn't really matter whether oatmeal is listed as the third or seventh ingredient, but what if an ingredient your pet is allergic to didn't make the cut at all? When it comes to the health of our pets, making sure we have access to the best possible data is of supreme importance - and having the confidence that we have the right information starts with knowing that it's consistent.